An interesting plot, although the hero has too many wonderful qualities to be believable. The biggest problem is the recording - the reader's voice sounds muffled, and it's often very difficult to find out what is being said. I bought this mystery on a whim, but once I started to listen to it I couldn't stop. The protagonist's obsession to solve the mystery becomes personal and that's when the action explodes into every corner of his life. The dramatic music was entertaining, but also ruined a few moments in the book for me because it cued me to know what was coming next. The narrator made the characters come to life with his ever changing voice. I liked his articulations of softly spoken females, foreign accents, and high-pitched voices of children. The book is short, but entertaining and I'm going to listen to When The Bough Breaks again and again. The plot was obvious; the surprises non-existent. I was bored. I would not recommend this book. This book is a prime example of why I normally buy unabridged books. I admire the clear thought process of Jonathan Kellerman, but this title was so badly butchered there was no story line. Whole segments are obviously missing. The book hardly starts before we are jumping to the thrilling conclusion with no clue how we got there. It was a waste of money. The first book is always the best. I have rad all of his books and was thrilled when I saw this on audible. 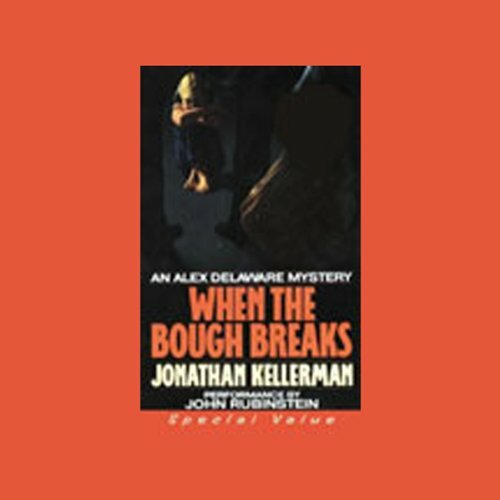 I've always liked Jonathan Kellerman's books. They're always read by very good actors. I enjoy them immensely. The first of the Alex Delaware novels and a little more simplistic than others that followed. Still a great read.